THE BUTLER is a pretty hackneyed, emotionally manipulative, conservative examination of US race relations in the twentieth century. Told through the eyes of a fictionalised version of real White House butler, the movie shows us the attempts by presidents from Eisenhower to Reagan to address the race issue, and the conflicting attitude of African Americans toward this struggle. The butler, Cecil Gaines, after a harrowing childhood experience of extreme prejudice and lawlessness of a 1920s cotton firm in the South, decides to use a strategy of smiling compliance in the search for safety. He will numbly hear anything, and be subservient to anyone, to keep his family safe in the relative middle class affluence of Washington DC. By contrast, his son Louis is affronted by this subservience, and first joins the peaceful protests led by Martin Luther King, before briefly flirting with the violent activism of the Black Panthers, and ending with direct political engagement. The problem with the film is that this political dialogue between father and son - between safe servility and dangerous activism - is so heavy handed and starkly drawn that it threatens to overpower what is actually the far more interesting aspect of the story - the character drama that sees a convincing marriage shown over fifty years. What gives this film emotional heft is not the fact that after years of prejudice, the Butler finally gets to meet President Obama, but that his wife is not there by his side, after decades of struggle, overcoming alcoholism and genuine love. That's the reason why I cried a little at the end of the movie - because that's the part of this film that has emotional honesty and authenticity. As for the politics, it's fairly simplistic in its opposition between father and son. The only nuance is delivered by the Martin Luther King character who makes a slight (and rather unconvincingly continued) case for the idea that the butler figure is not subservient but subversive. As for the depiction of the various presidents, this is fatally undermined by stunt casting and few of the famous actors chosen manage to transcend that "ooh look it's Robin Williams as Eisenhower" novelty to approach authenticity. I suspect the only one who really manages is Alan Rickman as Reagan - but he also has the most nuanced character insofar as he seems to have the most genuine connection to Gaines but also the most offensive race policies. The movie also plays a bit like history as "one damn thing after another". We spool through presidents, each with their allotted five minutes, until it becomes more of a fashion parade than anything else. One senses a rather cheap need to depict famous fashion moments with Nancy Reagan and the scene showing Jackie Kennedy in her famous blood-stained pink suit struck me as very exploitative indeed. The stunt casting of Mariah Carey as Cecil Gaines mother also fatally undermines what should be a very tragic character. So in all this - the stunt casting - the simply drawn politics - what is there to like in this film? A strong performance by David Oyewolo as Louis Gaines - the son who embodies the civil rights struggle. And most of all a magisterial performance from Oprah Winfrey as Cecil's wife who moves from blowsy drunk to noble loving wife. It makes you wonder about the performances we have missed because of her talk show day job. As for Forest Whitaker, a fine actor, I feel that he isn't given a wide range here - his character essentially being stalwart in his views and reactions until a small epiphany near the end of the film. He serves, if anything, as the counterpoint to Winfrey's Oscar-worthy performance, but that's merely the result of the script. 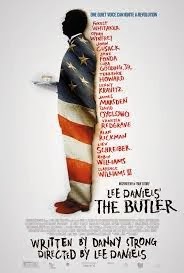 THE BUTLER is on release in the USA, Canada, the Philippines, Portugal, France, Denmark, Iceland, Israel, Germany, Kuwait, Indonesia, Spain, Sweden, Singapore, Finland, Australia, Brazil, Lebanon, the UK, Ireland and Mexico. It opens in Hungary on November 21st, in Romania on November 29th, in Belgium on December 4th, in the Netherlands on December 5th, in Norway on December 25th, in Poland on December 26th, in Chile and Greece on January 30th and in Japan on February 15th.